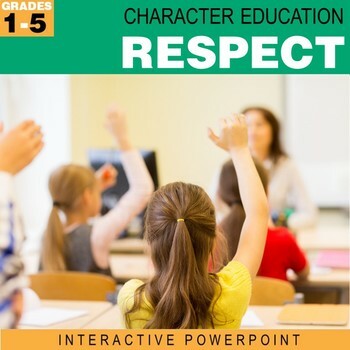 Teach your students the importance of being respectful with this fun, interactive PowerPoint! 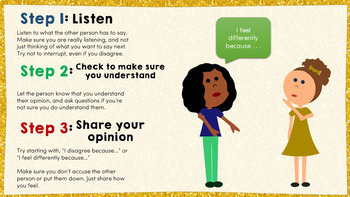 Respect is such a broad topic to teach to children. There are so many different aspects, but I've chosen to focus on three big parts of respect that are relevant to elementary students. Buy this lesson in a bundle and save 40%! 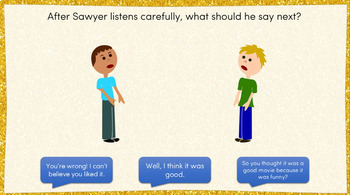 •Story to explain the importance of accepting differences. Check out more in this series below! Note to Buyers: The slides will appear to have overlapping text due to the animations, but when played as a slideshow will look normal. I recommend viewing the slideshow before presenting it to the students to become familiar with the way the buttons and slides are formatted.